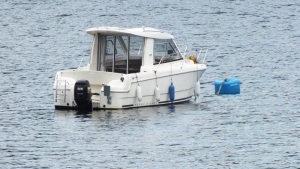 If a visiting boat uses one of the club’s two blue 15 tonne maximum Visitor’s Moorings and hasn’t paid the £10.00 charge by going to www.pay-mooring.co.uk or put the money in the letter box by the notice board near the castle, as stated on the mooring buoys, after 14 days all boats that haven’t paid will be displayed here. All boats are photographed that use the Visitors’ Moorings. These mooring buoys cost over £1,500 each to install and money has to be raised annually to service the moorings and pay the Crown Estate’s annual mooring fees too, so the club relies on the honesty of skippers to pay up and makes it easy using a credit/debit card via PayPal on the Internet even providing free WiFi Internet access at the moorings. We also say the fee can be paid once you are home! 2016 – five (5) didn’t pay of which one was for two nights. 2015 – four (4) didn’t pay, two of which paid the first time they came but not on subsequent visits which is disappointing. We send out up to four reminder e-mails but they still fail to respond – remember we provide the visitors’ moorings for you, not for us! One did respond a year later and paid and their yacht’s photo was removed from our website. Second time this yacht has not paid mooring fee!